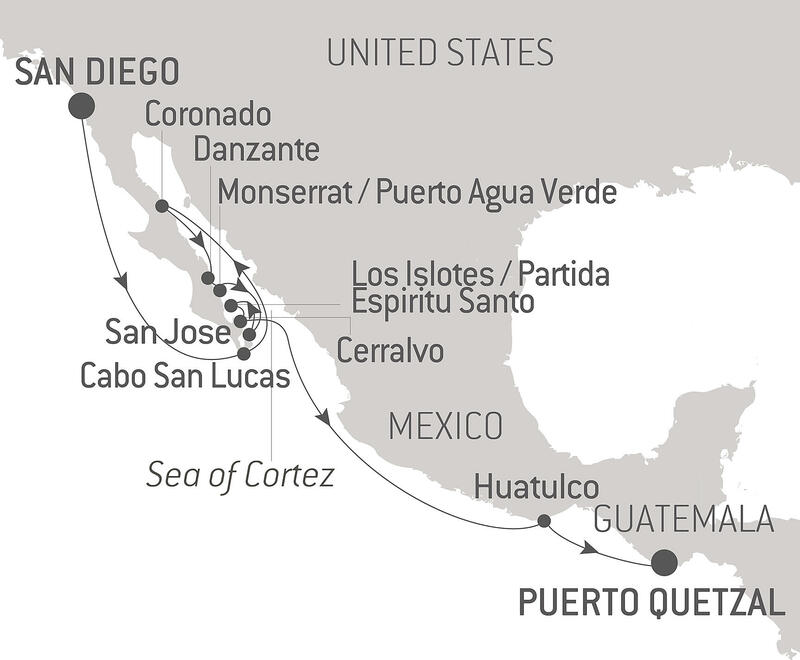 PONANT invites you to enjoy an unforgettable experience discovering the Sea of Cortez, during a 14-day expedition cruise. Aboard Le Soléal, feast your eyes on the unique landscapes and unrivalled biodiversity of the Gulf of California, following a brand-new itinerary. You will board your ship in San Diego, an American city at the far south of California, renowned for its pleasant climate. Your ship will sail along Baja California peninsula before entering the Gulf of California, known since 1539 as the Sea of Cortez in tribute to the conquistador Hernan Cortés. For five days, you will spend your time observing the incredibly rich marine wildlife, a veritable Eden which has rightly earned the region a listing as a UNESCO World Heritage Site. Playful sea lions, dolphins, whale sharks, tortoises, dozens of different species of fish: the teeming wildlife is quite simply fascinating. Le Soléal will drop anchor on a number of occasions near the different islands of the Sea of Cortez, and outings in Zodiac® dinghies will offer the chance for some unforgettable snorkelling and hiking tours. Your ship will then chart a course towards Huatulco in Mexico and its preserved bays edged with magnificent beaches, before reaching your final destination: Puerto Quetzal in Guatemala, very close to the charming colonial town of Antigua.